The Elegance Lounge at Assembly, George Square, really isn’t the best venue for Antonio Forcione. The pillars holding up the tent mask the stage whilst the sound of punters permeates from outside and this really is a music act to see as well as hear. That said, once the music begins, we are transported to another realm that blocks out all other noise. “The Fringe’s favourite guitarist” returns to Edinburgh once more. Forcione’s music incorporates elements of jazz, blues, and Spanish and South American guitar styles for a sound that epitomises World Music. This year’s performance coincides with his newly released album ‘Sketches of Africa’, bringing African rhythms and melodies to his playing. The live performance, however, is a whole new experience to listening to an album. 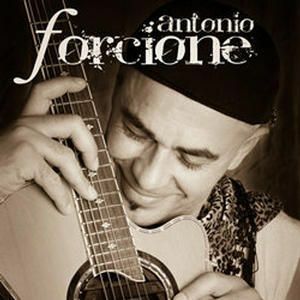 Forcione plays with unrivalled skill, incorporating finger-picking, tapping, percussive effects and other specialist techniques that are aurally and visually spectacular. You’ll be amazed you’re listening to just one guitarist. He’s also accompanied on-stage by Italian percussionist Dado Pasqualini and “the maestro” Seckou Keita from Senegal who plays the Kora – an African instrument that’s a cross between a harp and a banjo with a bright, shimmering timbre. Together, they create an air of casual intimacy in a jam session filled with improvisation that had the audience cheering and applauding after each song. The music contains lush harmonies, complex rhythms (some audience members even got up to dance!) and emotive melodies characterised with slides, scalic runs and flourishing licks. The three performers blended in rich textures, whist smiling and encouraging each other throughout. Particular highlights were the emotive Stay Forever, Madiba’s Jive (in honour of Nelson Mandela), the evocative African Dawn and Touch Wood – a solo number that allowed Forcione to really exhibit his talents. Most of all, the passion of the three performers is infectious. A technical marvel matched by stunning music, Forcione is a world-class guitarist. Sublime. Listen: 'Sketches of Africa' is available now. Watch: Forcione performs at the Edinburgh Festival until the 27th August. Written for Broadway Baby. For more reviews, visit the website here.